Mother's Day is right around the corner. And if you are like me (or my husband!) you probably procrastinate on getting gifts for most occasions. Not to worry! This year we have lots of ideas perfect for families with little ones! 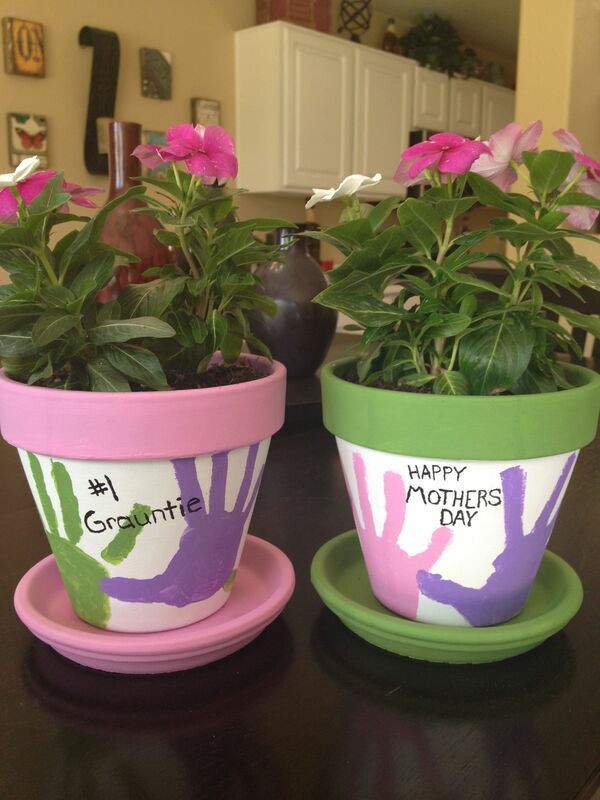 These ideas aren't too challenging and won't break the bank, but will have the sweet mom in your life saying "awwww". First let's talk about the DIY projects. Moms of young children love getting homemade presents. I am particularly fond of ones involving the little kids hands and feet. Those sweet little toes are only that size once, so creating a keepsake for mom is priceless. This is also a way to involve even the tiniest, newest members of your family. So even if you are a new family with only a baby please still do something for Mother's Day! Even though your baby will have no idea what is going on, Mom definitely will appreciate the thought and time you put in. To save on cost check out the dollar stores! You can buy paint, canvases and most other basic crafting supplies for a fraction of the cost of the craft store. This sign would also look great on a canvas! This mom used a rainbow stamp pad. If you don't have one you can just paint your baby's feet whatever colours you would like! I found this photo on Pinterest. You can use hands or feet like shown, or with older toddlers and kids you can just let them decorate it however they want. Small flowers for planting are readily available this time of year at many grocery stores, Walmart, or local garden centres. Here is a fabulous idea if you have older kids that can be trusted with glass. Help them paint a wine glass and buy Mom a bottle of her favourite wine to go with it! Let her sleep in and then enjoy breakfast in bed! As cliche as it sounds, Mom's really do LOVE this. Pamper her. Send her for a pedicure or massage. Don't just buy her a gift card, take it one step further and schedule the appointment for her. Bonus points if you and the kids do some housework or projects while she is gone. Is a spa trip not in the family budget right now? Help her create a spa experience at home! Get the kids involved and make a homemade sugar scrub and some homemade bath bombs. Set up some candles and get her an hour to herself of uninterrupted time in the bath! Flowers are always a safe way to go. If you live somewhere that you can put potted plants outside, maybe opt for potted flowers that she can enjoy all summer! Support other local moms and families! Post in your local Facebook buy/sell group asking if anyone makes or sells any great Mother's Day gifts. Maybe she would like a new Thirty-One bag, or Scentsy warmer, stamped jewelry, hand painted wooden sign, etc. You will be surprised at the amount of response you will get! Just make sure it's not a group she is part of too. Print and frame a favourite photo of the kids! You can get same day quick prints at Walmart, Costco, and many drug stores (like Shoppers, CVS, Walgreens, etc). Don't forget the card! Cards have gotten so expensive. Save the $6 and make it more sentimental by having the kids make it. You can just fold a piece of plain paper and have them decorate it. If you are feeling extra crafty here are some cute card ideas as well: Click on the photos to go to the tutorials. Just remember this day is all about making sure Mom feels loved and appreciated for all she does while letting her just enjoy a day of the "fun" parts of being a mom (you'll get your day next month!). Allow her to rest and get in some kid snuggles by helping a little extra around the house, crossing off a couple items on the "honey-do" list, and skipping going to your buddy's house to watch the hockey game. I promise you will totally make her day! I find it a night and day difference when a doula or a midwife is involved. Thank you for being that change to moms everywhere, wish I could go back myself and do it that way to!